Specifications: It comprises of 2 nos. of H Shape Section, 2 nos X Shape bracing.Usage: It is extremely easy to use and adjust commonly used for wall plastering, repairing, facade work and support staging. Scaffolding frame Set / H Frames use in Plastering, masonry and general construction work. 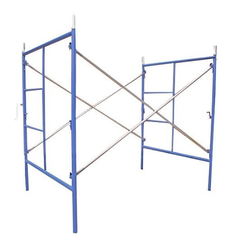 The H frames are safeway style and compatible frame scaffolding. This frames are manufactured from highest quality of MS Pipes. In order to cater the variegated demands of our precious clients, we are offering an excellent quality range of Industrial H Frame. With the support of our talented team of professionals, we are involved in offering the best quality of H Scaffolding Frame. 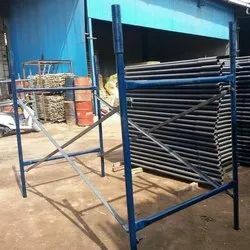 Backed by profound experience of our experts, we are an unparalleled name engaged in manufacturing high quality assortment of H Frame Scaffolding System. - In civil engineering projects for construction purposes in various residential and industrial sectors. The combination of H-Frame and Scissor Cross Bracing can be used as Scaffolding for plastering of buildings, slab casting, Industrial structures, Glass Cladding and Maintenance work for industrial use. H-Frame and Scissor Cross Bracing are used as staging for floor slabs casting at more heights of commercial industrial buildings and also for Staging of Bridges, Flyover. These are widely appreciated in the market for its strong construction, low maintenance and longer functional life. It is made from standard scaffolding pipes. Two Rectangular Frames, also called H-Frames, are braced with cross bracing angles which are secured on H-Frames by split pins. >Material: Made out from 48.3 mm diameter x 3.2mm thick high grade M S / Galvanized steel tube, Consists of welded frame of two vertical and two horizontals, With upper side socket tube 60.3 mm od x 3.6 mm Thickness.